Lisa Holdsworth knows what she’s talking about. Her TV writing career, which you can see in full on her agency-biog page here, kicked off with an episode of Fat Friends in 2002, then snowballed through the likes of Emmerdale, New Tricks, Blue Murder, Waterloo Road (for which she notably wrote the excellent book-ending instalments of the show’s recent Series Four) and Robin Hood (she has an episode on this very evening - 6.45pm on BBC One). She has a Twitter page here. 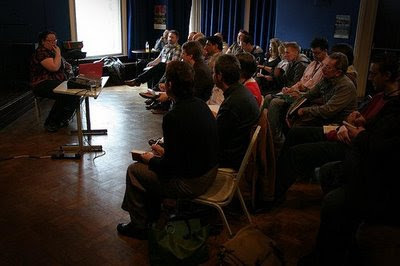 The Story Engine event (see general report in my previous post) saw the lovely, funny Lisa giving a top-notch class on pitch documents – those mysterious beasts which most screenwriters would appreciate being given a step-by-step guide to. So here it is: pitch-docs, the Holdsworth way. … tell the story in minute detail. If you’ve written over two pages, you’re telling too much story. … tell us about every character. And try to avoid character clichés: the geeky-but-cool character, or the feisty single mum. Find something interesting and unusual about your characters. … tell us the intended TV slot. … tell us how it’ll be shot. “If you say it’ll be shot ‘a bit like The Wire’,” says Lisa, “That makes you sound a bit like an arse”. … tell us who you intend to cast… unless an actor is attached. Even imagining an actor can limit you, when writing the character. … include comparisons to existing characters or other dramas (although Lisa admits this is more her preference, noting, “Do what feels right for your project”. … communicate excitement. Too may pitch docs are too professional and dry. Without actually saying, “You’ll cry! You’ll laugh”, get that across. Be conversational. … explain why this needs to be brought to the screen, right now! Because that’s the first question someone like Channel 4 will ask you. Maybe you’ve got an idea for a period costume drama, but it says something about where we are now. … make us love/hate the main characters. Even if they’re flawed, are we going to really enjoy spending time with them? … tell us why people will watch your show. Here, Lisa added a related point: “If you don’t watch telly, I don’t know why you’re writing it”. … pack a punch. You want the reader to be exhausted by the end. Every paragraph needs to finish with “BANG!”. Not literally, of course. … leave them wanting more. This is difficult to do without being too obvious. You want to convey the sense that you’re just giving them a taste. Without actually saying it, you’re saying, “Bring me in for a meeting and you’ll get so much more”. Pitch docs tend not to tell them the end. Says Lisa: “I’ve never worked on a programme where the end didn’t change”. If you’re pitching a film, people need to know it rounds off quite well. Whereas, with a returning series, it’s best to leave it open. Americans are very good at making you wonder how they could do a second series of this. A grabbing title. Heroes, Buffy, Demons (which was originally called The Last Van Helsing, until makers Shine realised that this title suggested a weight of history which wasn’t reflected by the execution). Firefly, reckons Lisa, was a great series with a terrible title. A logline to create intrigue. This is usually the last thing you put in. A summary paragraph that sells the central premise of the show. If your project is an adaptation then here’s the place to mention it, up front, noting that it’s about time this was brought to the screen. One-to-five pages of blistering prose that sets up the story, the main characters and the style/tone. Lisa usually writes three pages, then edits it down. A final paragraph that explains why this is the show your telly was made for. You’re basically saying, “If you buy this, you’re buying a fantastic piece of TV”. Take your self-deprecating hat off. Don’t be Simon Cowell, but say you believe in this. Write nothing about your credits or who you are – it detracts from the flow of the pitch. If you’re sending it ‘cold’, attach your CV as well. ”Remember – they’re always looking for a reason to say no. Don’t give them one. Don’t mention the scene in which a load of penguins get machine-gunned”. ”You won’t be held to the pitch doc, if you get to the next stage. People in the meeting will want to change aspects of it”. ”Once in meetings, pick your battles. Don’t argue over the colour of a secondary character’s socks. If someone’s suggestions piss you off, then go away, have a rant, have a cup of tea, then come back and think about it objectively”. ”Even if you end up writing seven drafts of a pilot script and it comes to nothing, your final draft will make a great calling card script”. Thanks for putting this up, Sir. I would have attended Lisa's workshop had I not been blathering on about online drama (and why web dramas beginning with a blog to camera should be banned- er, except for 'Sofia's Diary) in another room. Pitch docs are indeed a tricky beast. You're always treading that fine line between 'sell the sizzle' shorthand and putting something as vapid as 'with hilarious/shocking/devastating consequences. I just wish more treatments and pitch docs for produced series were posted online. I can just make out my shiney head in that picture. It was indeed an excellent session and a real eye opener. I was ignorant to Lisa's work before The Story Engine but she was one of the big stars of the event for me. May her sizzle continue to sell.